Frank McCourt continues his attempt to build Boston West. He often gets Sox players past their prime. He also had a former manager until he realized too late that Grady Little may be a great guy but not the best manager. 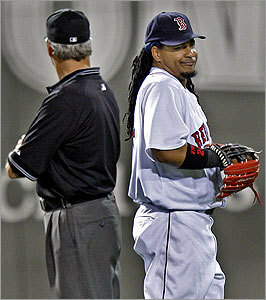 Today, they traded for Manny Ramirez who has worn out his welcome in Beantown. The Red Sox paid quite the price to be done with Manny. They pick up the rest of his salary for the year. Reports have them also sending out Brandon Moss and Craig Hansen to the Pirates in the 3-team trade. I liked Moss, but he didn’t seem to have a place on the Red Sox. He’ll get the shot he deserves with the Pirates. Hansen needed a change of location (Orel Hershiser’s analysis of his mechanical issues the other night was great by the way). The Pirates made out like bandits because they also picked up Andy LaRoche and Bryan Morris from the Dodgers. They got ripped off by the Yankees, so they made the Sox and Dodgers pay. So far all the Sox receive is Jason Bay. That can’t be all. Really… Theo, you had to do better than that, right? Otherwise the Dodgers and Pirates really took advantage of their need to dump Manny and his bad attitude. This is addition through subtraction in my view. Bay should benefit from being surrounded by better hitters, and may slide nicely into the 5 spot. Putting him right behind Ortiz may put too much pressure on the new guy. Of all the Manny moments in Boston, the last ranks as one of the most confounding. Within an hour after Red Sox general manager Theo Epstein informed Manny Ramírez he had been traded to the Los Angeles Dodgers Thursday, Ramírez’s agent, Scott Boras, called the Sox back, according to a source with direct knowledge of the negotiations. If the Sox dropped the option years on his contract – which they had agreed to do if they traded him – Boras said Ramírez would not be a problem the rest of the season. For the Sox, the source said, Ramírez’s pledge of good behavior only served as a tacit admission that his disruptive conduct of the last couple of weeks had been calculated, and they had had good cause to suspect more was in the offing if they did not trade him. The Sox told him thanks but no thanks, what was done was done, and pack plenty of sunscreen. And I missed this little part of Manny Being Nefarious. “We were in a bit of a difficult circumstance and we made something good of it,” said Epstein, who was in Anaheim two weeks ago when Ramírez balked at boarding the bus taking the team to the airport and a flight to Seattle. I’m guessing that makes the Dodgers’ fans really excited. Manny really didn’t want to go there- all a show, just like the last few weeks. Manny reveals himself to be a petulent, greedy man. He’s also a man who thinks of no one but himself- consistently avoiding opportunities to reach out to fans, especially the Jimmy Fund kids. This taints the fond memories I have of him as a ball player. Ted Williams, the greatest hitter who ever lived -IMO- was notoriously self-centered, but was a big supporter of the Jimmy Fund and baseball camps/clinics for kids. Manny … not even close. I spent the last 2 Sundays preaching on Hebrews 12, well, the first 11 verses of it anyway, at a local PCA church. There sermons were The Race of Faith and Instruction Thru Hardship if you are interested. It was a more traditional environment, and the congregation was generally older. So, to be all things to all men (1 Corinthians 9), I didn’t have any illustrations from movies or other aspects of pop culture. You have to speak it so they’ll get it. I hope I did that. I changed the tenor of things, but the message is still the same. Like the infamous French defense entrenchment that did nothing to hold back Nazi Germany, or Khadaffi’s “line in the sand”, Manny has passed the line which means he must go. Until this past week I was loathe to trade Manny, and hoped they would pick up his option. But Manny Being Manny has reached a nefarious stage where it is no longer funny- at all. And I think it no coincidence that while it occurs the Red Sox get swept by the Angels. Manny has gone on the offensive, and is downright offensive, crossing that line. “The Red Sox don’t deserve a player like me,” Ramírez was quoted as saying. “During my years here I’ve seen how they have mistreated other great players when they didn’t want them, to try to turn the fans against them. “The Red Sox did the same with guys like Nomar Garciaparra and Pedro Martínez, and now they do the same with me. Their goal is to paint me as the bad guy. I love Boston fans, but the Red Sox don’t deserve me. I’m not talking about money. I’m not sure what the Red Sox have said to make Manny look bad. Did they push the traveling secretary? No, that was Manny. Did they let everyone know what the penalty was? No, they handled it internally. Did they talk about not negotiating in good faith? No, that was Manny. Are the Sox complaining about the option? No, that is Manny worried about his next paycheck (like $180 million the last 8 years just isn’t enough). Manny has put himself in the position where the fans have turned on him. No one else is to blame, not even CHB. So, Manny Being Manny has become poisonous. It has shifted into a whole new orbit, and Manny has become like Nomar in his final season with the Sox. He has become worse than a distraction, but a cancer. The rumored trade looks good to me right now, particularly since it ships Manny away. It looks fiscally sound, and addresses their needs at this time. If they can’t trade Manny, I’d suggest putting him on the DL with that knee issue just to get him away from the team for a week or two to let this thing simmer down. But Manny has just worked against his goal to get a big, fat contract for the next 4 years. Does anyone want to pay that much to watch the Manny Being Manny show that long, when he is no longer one of the best hitters in baseball? Sorry, Manny … that time has come and gone. This year the baseball trade deadline has prompted to some very exciting deals- if you cheer for the Yankees and the Angels. The Yankees are repeating the pattern of the past, though with a bit less luster. They are taking on additional payroll (with that ever end???) and sending back prospects or low money guys in return. First they bring over Xavier Nady and his .320+ average to fill their hole in left field, as well as giving them a right handed bat that has been missing to restore balance to their line-up. That deal also brought them a solid left-handed reliever. The analysts basically agree this deal was a steal for the Yankees. They have Nady signed for next year at an affordable salary, and an option for Marte. So, this is not a rent-a-player situation. Marte’s presence allowed them to ship out Farnsworth, which saddens me. The hard throwing relief pitcher was hittable often enough. In return they pick up an aging Ivan Rodriguez. He started the year slowly at the plate, but has brought his average up to about .290. So, they add a strong bat behind the plate, replacing Posada who is done for the year. From the Tigers’ perspective, this move surprises me since they seemed to have climbed back into the AL Central. This is basically a salary dump. 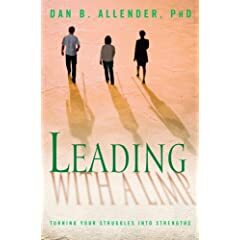 They have positioned themselves nicely for the stretch run in an organization where failure is not an option. The weak and vulnerable Yankees of April-June are once again gone as Brian Cashman made some wise moves internally (some forced by injuries to guys who weren’t performing as expected), and brought in some guys to address the remaining weaknesses. All we can hope for is that they lack chemistry. Only they could do this because they added millions in payroll. The Angels also made a really good move in picking up Teixeira for Kotchman. That is a big improvement in my book. Though he might be a rent-a-player. But the Angels see this as the year they could go all the way. They have the pitching, and needed 1 or 2 more good bats. Teixeira is the piece they needed to avoid a repeat of last year’s playoff sweep at the hands of the Red Sox. If you haven’t noticed, the Red Sox payroll has been decreasing over the years. They are showing greater financial restraint, but this may come back to bite them like it did in 2005. They are trying to dump Manny and his primadona act. His recent actions seem to be mostly about his desire to make more money. It is hard to avoid thinking that he no longer wants the Sox to pick up that option because he wants another $100 million contract- which seems unlikely with his diminishing skills. But Scott Boras only makes money on Manny if he does get a new contract instead of the option. So ….. this round of Manny Being Moronic seems to be driven by money since he sure is hitting well for a guy with a bum knee. But he seems to play better when there is drama going on, so who really knows. The only remaining possibility out there, after the Phillies, Mets and Dodgers have all denied any interest, seems the Marlins of all teams. It is reported the Red Sox could get either Josh Willingham or Jeremy Hermida and a prospect in return. I doubt anything will happen though. Maybe the Marlins think Manny will actually put some fannies in the seats there. The Rays have been mentioned in rumors, but I couldn’t see them picking up any of these guys, contrary to what I hear on the local sports radio. The owners don’t want to spend that much extra money, and they don’t want to give away their prospects. You aren’t getting any of the players traded for Johnny Gomes, folks. They have survived a stretch where they have not produced many runs, which is a positive. The local jock talkers think they have the guns to score lots more runs. I suspect this latest stretch was a “regression to mean” after some superlative play. The real Rays are somewhere between those 2 offensive extremes. Longoria has been killing my fantasy team the last few weeks (as have a few other guys- I even dumped Ellsbury which may come back to haunt me). But the re-constituted Yankees will surpass the Rays until A-Fraud does his typical October disappearing act. While de-cluttering the home this past week, I bid a fond farewell to these old bottles. Each of these bears fond memories. Each was given to me by a friend, and is one tasty treat. The first is Rogue’s award winning Shakespeare Stout. It comes in the ample 22 ounce bottle. It is a great stout- flavorful but not too heavy so my eyelids don’t become too heavy. This was given to me by my friend Danny who has introduced me to West Coast handcrafted beers. 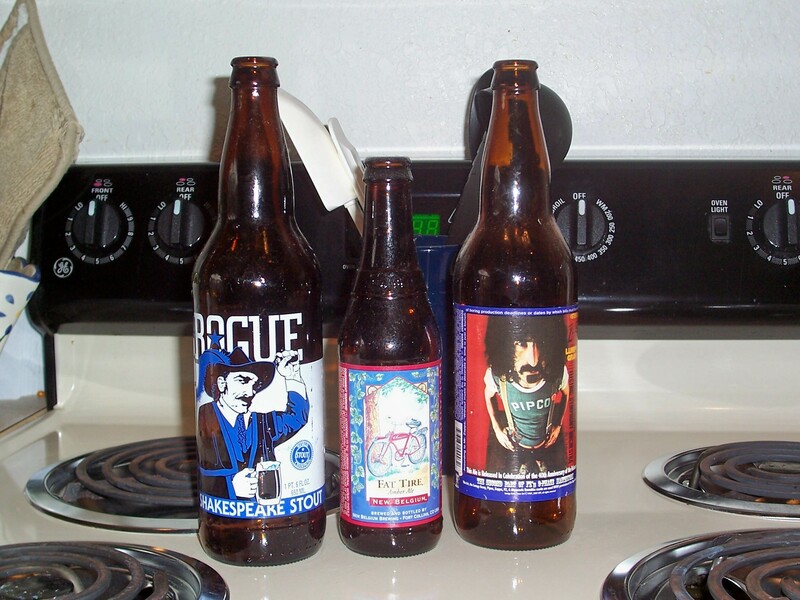 The middle bottle is a Fat Tire amber ale. Tod & Virg brought some back from a trip to Colorado and let me enjoy one. I rather like the amber ale contained within (I haven’t been wild about the Belgium whites I’ve tasted). It is produced by New Belgium Brewing. Recently, my friend Morgan returned from a house-hunting trip in TN with a 22 ounce bottle of Fat Tire for me. Fat Tire has crossed the Mississippi and can be found in TN. I am awaiting the proper moment to enjoy it. The third bottle also comes from Danny. He did his usual tour of the Lagunitas brewery and returned with Lumpy Gravy. This is a special release to commenorate the anniversary of the release of that Frank Zappa album. He thought it would not be shipped out of CA, but it has shown up at our local ABC Liquor store. It is an unusual beer. I thought it was like a cross between a stout and an ale. It was quite enjoyable.